Starting life at the Wandsworth Arts Fringe and sponsored by the Racing Post newspaper, Justin Hopper’s Flutter is an intimate but thoroughly judicious examination of gambling. 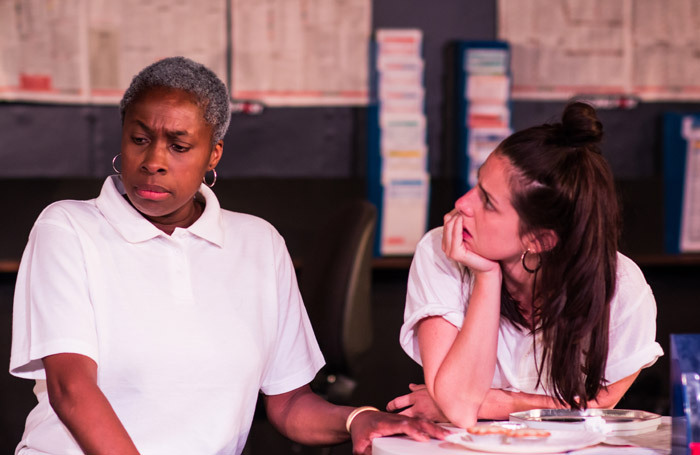 The set is a suitably functional and plain betting shop interior, featuring a long counter dotted with pots of tiny biros which the patient manageress, Rose (Antonia Kemi Coker) tries to use as a barrier to keep out the lives of her punters. She doesn’t need to talk much or venture out from behind this counter often to mark herself out as the ruler of this tiny ecosystem. Gavin Dent’s smooth production draws attention to the sometimes dubious morality of these shops, while acknowledging the refuge they offer these bright, slightly exaggerated characters from their responsibilities, loneliness and an increasingly gentrified neighbourhood. The cast deliver warm performances as the staff and regulars for whom their local bookies at once acts as social centre, entertainment, corrupting influence and the ultimate leveller. Hopper sells the fumbling romance between Rose and Mark Keegan’s Dennis, a reformed gambling addict, as these are earnest and likeable people forever cleaning up everyone else’s messes, while Shango Baku and Richie Donaldson make for two of the more enjoyably eccentric customers. Few surprises are to be had, with the path of each character entirely visible from the outset, but there’s pleasure to be taken in the efficiency and affection of Hopper’s writing.